Life is full of choices. Perhaps too many choices. Some are filled with the potential to be life changing, while others are small and perhaps mundane. For me, Roller Derby was a significant life choice. Before my first practice, I sat in my car for a half hour outside the venue, until I finally convinced myself to walk in and introduce myself. I’m so happy I did. I didn’t realize it at the time, but it sent me on a life path that I didn’t know was possible. And now, I am here to encourage anyone, who is on the fence about joining the sport, to go for it. It’s easy to validate any excuse in our heads. However, if we can convince ourselves we aren’t meant to play Roller Derby, what else in life have we convinced ourselves that we can’t do? We have so much potential as humans. We are walking meat bags waiting to accomplish something great. We just need to allow ourselves the chance to succeed. If we don’t try things, we get to avoid failure, but it also means we don’t get to experience success. I tend to make my choices with the mantra, “no regrets” in mind. I even have it tattooed on my wrist (spelled correctly of course) as a constant reminder to make the choices that I find to be most fulfilling. Sometimes those choices are ridiculously scary; however, it is usually the scariest choices, that are the most rewarding. Let us not shy away from the things we want to do, simply because we fear we aren’t capable. Let us not allow fear to make us regret the things we did not do. And let us always remember, we are all wonderful walking meat bags full of potential. Have you ever hated yourself because you couldn’t fit inside societies little box? I have always been different and, for a while, I had this strong desire to just, fit in. Everyone finds Roller Derby at a different point in their lives. Some people, will honestly say they were saved by the sport. 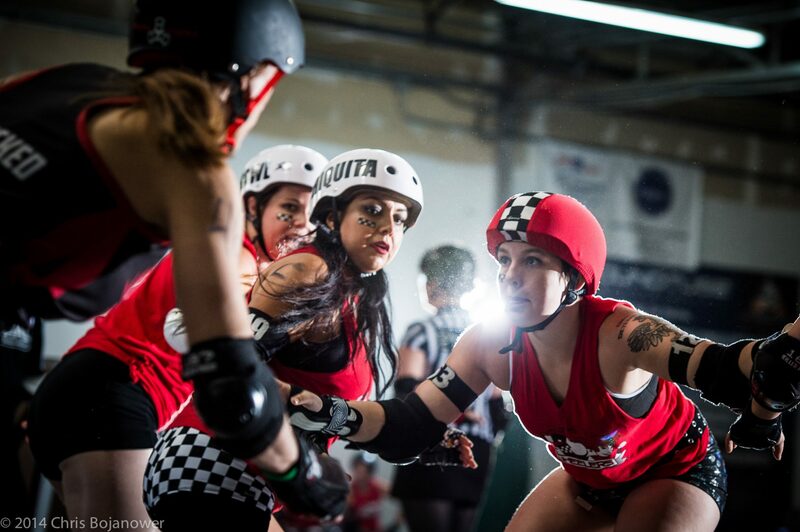 I found roller derby at a time in my life when I was frustrated with who I was. I wasn’t even comfortable in my own skin, and I felt like I didn’t have a place in the world. As a result, I was just kind of existing, but not living. I moved a lot as a kid. From kindergarten to sixth grade, I attended six different elementary schools. I was also, very shy and quiet. Sports were how my parents got me out of the house. I was always good at sports, so long as the sport interested me. From first grade through college, I was always playing in some sort of club or team sport. At various points in my life, I participated in: soccer, tee ball, tennis, track, fencing, lacrosse, and team handball. Fencing and team handball were my collegiate level sports. I began to find more unique sports as a got older. For some reason, the less common or main stream the sport was, in the United States, the more passionate I was. So I guess, it was only a matter of time before I found roller derby. As I mentioned in my, about me post, I didn’t see my first roller derby game till May of 2012. Leading up to that day, a lot had changed in my life, in a short period of time. I graduated college in May of 2011, moved to Missouri for a few months of job training, then immediately moved to Washington state to start my new job. Even though I was used to moving my whole life, I was not prepared for how drastic of a difference it would be to move without my family. I was suddenly on the West Coast for the first time in my life, while my parents and siblings were across the United States in New Jersey. The only person I knew, in Washington, was my roommate. Thankfully, he was a friend from college, was from Washington, and had family in the area. He kept me from drowning alone in my shyness. I say shyness, but lets be real, it was straight up anxiety towards social settings. On top of being on a new coast and far away from family, I was also in a weird place in life, in terms of understanding who I was. To be cryptically frank, I was one foot out of the closet and contemplating diving right back in. So while feeling a little lonely, a little unhappy, and a whole lot lost, an unexpected opportunity popped up. My roommates brother started dating a gal, who played roller derby, and wanted to get a group together to go see her next bout. My roommate extended the invite to me, and I was all for it, mostly because he was going, and I knew I could rely on him to make me feel less awkward in a social setting. PS: Please note, that my opinions held here, within this blog post and all future blog posts, are just that, my opinions. If you disagree with anything I say, please feel free to engage in respectful dialogue in the comment section below. I can also be reached at jukes@derbylisting.com. Thanks for joining me on my blog-venture!! Welcome to the Blog Party! Hey everyone, it’s Jukes. I just want to welcome you all to the blog party. I’ve wanted to start a blog for a while now. However, I wasn’t really sure what I wanted to write about, or if I had anything worthwhile to share. All I really knew, was that I enjoyed writing. I would never classify myself as a writer; I would say that I’m the kind of person who often ends up sharing advise and making people laugh via email or text. Ultimately, I always knew I wanted to write about something positive, and wanted to share that positivity with other people. I see starting a blog as an opportunity for personal growth. It’s a chance to hear from people with similar or differing opinions, to either solidify or broaden my way of thinking. This is also an opportunity to step out of my comfort zone, and try something new. Lastly, writing is a necessary skill to have, and a great way to get better at it, is to do it often. Along with that, this is a chance for me to see if blogging is even my jam. I’ve never been able to maintain a journal as a kid or even as an adult. And blogging is like a public version of that (so what in the world am I doing??). Right now I’ve scheduled myself to post every two weeks. Figured, I would start out slow and see how it feels. Every two weeks sounds doable, right? Well, we’re about to find out together.